India wrapped up a historic series win in Australia by drawing the last Test in Sydney on Monday. 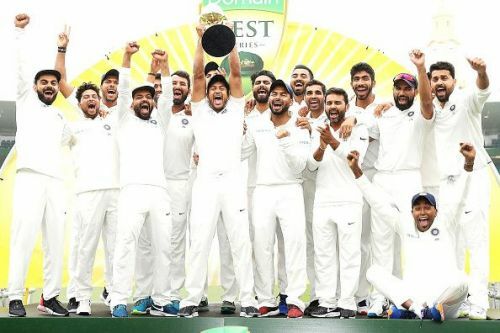 By winning the first and third Tests, and losing the second, India won the Test series 2-1 and finally shed the tag of being home giants, having won a series in Australia for the first time. As the series came to an end, we take a close look at the players who played their part for India and how much we rate them in our books. Murali Vijay played the first two Tests of the series in Adelaide and Perth respectively but failed to repay the selectors for having shown faith in him again. He was essentially drafted into the side to lend an experienced hand to India's young openers Prithvi Shaw and KL Rahul, but sadly, Vijay could not quite make the mark. India's young opener from Karnataka KL Rahul's defensive woes were compounded with accurate lines from Australia's Mitchell Starc, Josh Hazlewood, and Pat Cummins. He was constantly finding ways to get himself out bowled as he scored a meager 57 runs in this series with an average of 11.40. India drafted in domestic powerhouse Mayank Agarwal when Prithvi Shaw had to return home due to an injury he picked up during a tour game. Agarwal instantly made a mark and got a half-century on debut. He scored another in the next Test and played one of the most crucial innings in the series. India's new 'Wall', Cheteshwar Pujara, hardly put a foot wrong in this series. Having broken Australia's back with three flawless centuries and one half-century, the man from Rajkot finished the tour with 521 runs at an impressive average of 71. Indian captain Virat Kohli had an impressive series but was a bit subdued as per his own standards. He ended the tour with 282 runs at an average of 40. However, Kohli's leadership qualities were hugely impressive. India's vice-captain Ajinkya Rahane flattered to deceive on another overseas tour and could manage just two half-centuries in the series. Rahane did play crucial knocks when required but a lot more was expected from the man from Mumbai. Andhra and Hyderabad stalwart Hanuma Vihari impressed everyone with his half-century on debut at The Oval earlier this year but failed to capitalise on the starts he got in this series against Australia. He played a good knock at the top of the order in the Boxing Day Test but apart from that, he was average. Unfortunately, Rohit Sharma's Test woes continued in this series against Australia. He returned from the tour with just 106 runs from the two Tests that he played. He left to India prior to the beginning of the fourth Test due to the birth of his first child. India wicketkeeper Rishabh Pant had a brilliant series both in front of and behind the stumps. He ended up being India's second-highest run-getter with 350 runs at an average of 58 and also effected 20 dismissals. Ravindra Jadeja got opportunities in only two Tests in the series and played a vital knock in Sydney which allowed India to enforce the follow-on to Australia. With the ball, Jadeja was impressive with his tight lengths. Ravichandran Ashwin's injury woes failed to let him play the entire series. He managed to play in the first Test in Adelaide and took three wickets in both innings. Ashwin was India's main spinner going into the tour but injuries took that right away from him. Australia just could not pick chinaman Kuldeep Yadav, who took a five-wicket haul in the last Test in Sydney. He added guile and disguise to his deliveries which, in turn, led him to be successful. By far India's best bowler on tour, Jasprit Bumrah's accuracy was one of the key reasons why India managed to decimate Australia's batting lineup every game. He finished with 21 wickets in the series. Ishant Sharma was on his third trip to Australia and impressed everyone with his suffocating line and length. The Delhi speedster finished with 11 wickets but was ruled out of the last Test due to injury. Bengal fast-bowler Mohammed Shami picked up 16 wickets in the series and was mightily successful against Australia's inexperienced batting lineup. He proved to be the ideal foil to Jasprit Bumrah and Ishant Sharma. Umesh Yadav played the second Test of the series along with Ishant, Bumrah, and Shami but was rendered hugely ineffective. He, however, picked up two crucial wickets.